Unived Athlete Laura Kline visited India during the first week of January, 2019. Laura was on the sidelines for most of 2018 due to a hip injury. 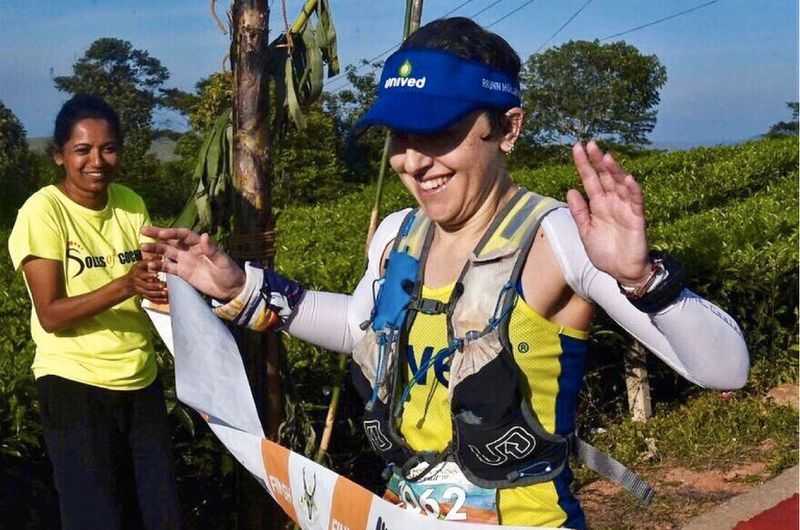 Not having raced much in 2018, Laura signed up for Vagamon Ultrail 90K, which takes place during the first weekend of January in Kerala, India. 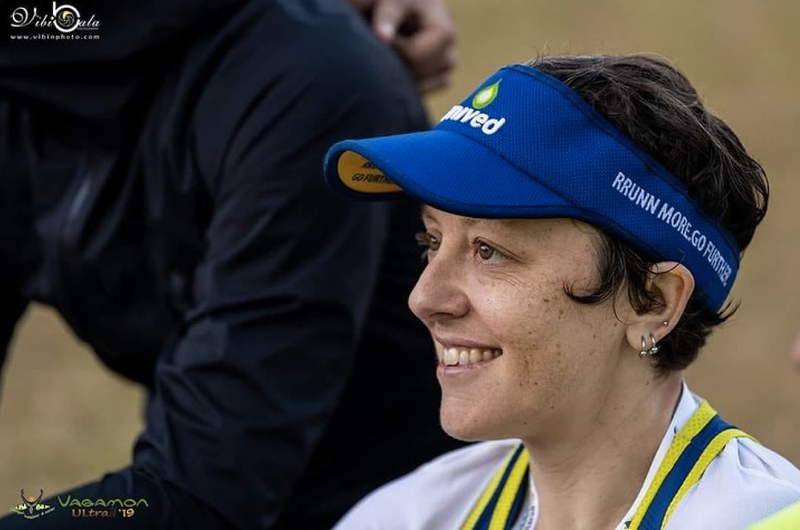 We caught up with Laura after the race and here is what she had to say about recovering from her injury, her first visit to India and racing an ultra in India. 2018 was a tough year for you, as you were injured. What advice would you give anyone that is suffering from an injury? When you’re faced with an injury it’s very easy to become depressed over what you will be missing out on. The key is to keep that period of mourning short, and instead focus on positives. For me a period of injury allows my whole body to take a break from the rigours of training and racing that it may not receive in a short off-season. I look to this time to become fully rested while focusing on other areas of my body that may need extra attention. I also spend a lot of my down time researching – looking into the “why’s” of my injury and formulating a plan to come back stronger. Focusing on a positive future helps keep your mind off the present pain. It’s also a great time to catch up with friends and family, as you may not have as much time off for them when you’re in training/racing mode. Having a positive social life is also healing and a great distraction! How did you maintain your fitness during your injury period? During the first few months I was banned from any activity, so the key during that time was to focus on nutrition. Although you don’t have to be as regimented about fuelling your body, nutrition plays a major role in healing! I stuck to a mainly whole-foods diet and made sure to drink my Unived Daily Supergreens daily! I also supplemented with CalDveg, Liquid D-veg, and Colox to promote healing in my bones and joints. 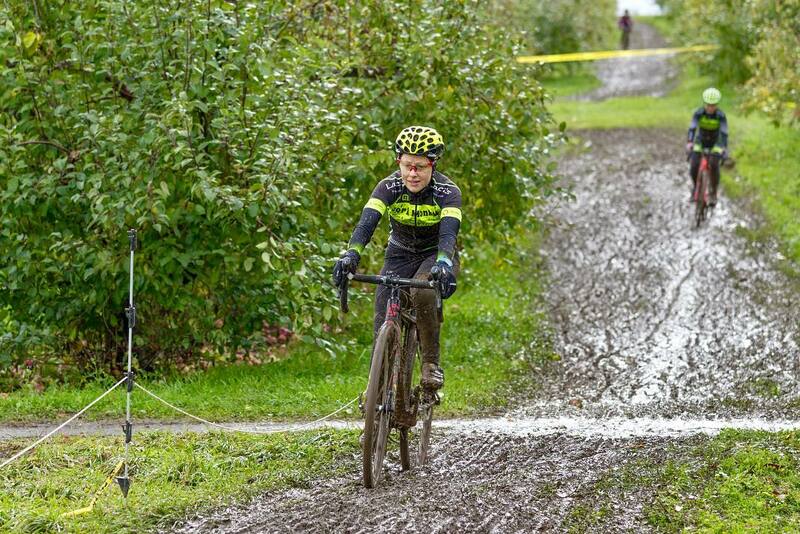 Once I was cleared for some activity, I decided to give a new sport a try – cyclocross! Trying something new and exciting (not to mention lots of dirty, muddy fun) was another great way to distract my mind from the running I was not yet allowed to return to. I was able to start rebuilding my fitness, while also having a blast! I also got back to weight training as soon as I was cleared, so that I could strengthen the areas that had weakened due to the injury and reintroduce a weight-bearing load to my legs. Rebuilding strength is key to a healthy return to running. Why did you choose Vagamon Ultrail as your first ultra after your injury? When you’ve taken an extended time off from an injury there are a lot of emotions involved in your first comeback race. I wanted my first race back to be new and exciting – a celebration! I had never been to India and from what I could tell, the course looked challenging but not too tough, and absolutely beautiful. Racing Vagamon Ultrail also meant I would be able to race alongside my Unived Family who have been so supportive of me through my injury. Celebrating the gift of running with them made it even more special. As it turns out I picked the perfect first race! Vagamon Ultrail 90K was your first ultra after 6 months of being on the sidelines. How were you able to train for it? The training build for this race was difficult as I was starting back at zero and needed to ramp up the volume in a short time. I played it smart and opted to keep the mileage much lower than I would have liked in order to build safely and show up to the race healthy. I did not have time to focus on hill workouts or speed sessions – I simply spent my time building base mileage and focusing on my strength and bodywork. My highest mileage week leading up the race was only 47 miles! What was your experience at Vagamon Ultrail? Did you ever feel like quitting during the race? The Vagamon Ultrail was a first-class race experience. It was very well-organised, well-marked, and provided plenty of well-stocked aid stations. Not only well-stocked with food and drink, but also with enthusiastic and friendly volunteers who went above and beyond to provide a great experience for the runners. What was your nutrition strategy for the race? I was very excited to have the opportunity to test Unived’s new Elite line of RRUNN products during this race. We will be sharing more about these exciting new products soon, but let me tell you – Unived is nailing it on the flavours and fuelling ratios! Throughout the race I drank 6 bottles of RRUNN Elite Electrolyte Mix and consumed 1 RRUNN Elite Gel per hour. I supplemented this with some orange slices and water at aid stations and also popped a few RRUNN Caffeinated Salt Caps to help me battle the heat. I also enjoyed a few cups of the RRUNN During Electrolyte Watermelon Mix that was being served at aid stations because who doesn’t want a refreshing watermelon drink during a hot race? I was extremely pleased with the new products – my stomach felt great all day and the only lag in energy I felt was from the heat. Are there any unique items on your race kit that are a ritual? You also wore the new Unived Race & Recovery Socks for the race, any feedback? I did not have any unique items on my kit for this race. I considered bringing Chekutty but I didn’t want it to be ruined. I was very excited to wear the new Unived Visor though! 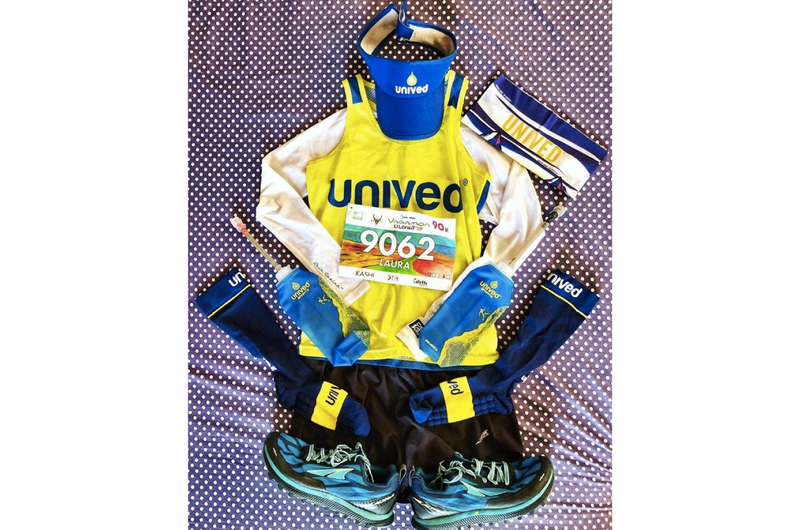 I was completely impressed with the Unived Race & Recovery socks and will definitely be relying on the new Unived line of socks in my training and racing. The material was very soft and comfortable and I’m a big fan of the arch compression. I’m also completely sold on the 3D DOT technology. My quads may have been crying in pain at the end of the race but my feet were fresh and ready for more! What was your recovery period after the race? As a vegan do you feel like your recovery is faster? How long have you been vegan? I was surprised to have recovered so quickly from this race – I thought my time off and the distance would leave me feeling depleted and sore. Vegan power!! I had some typical soreness the day after, but by the second day post-race I already saw much improvement. I took a few more days off once I got back to the states to recover from the travel, but as soon as I got back to running I felt great. I definitely feel like my vegan diet helps me to recover faster. When you’re fuelling your body with fresh, living nutrients it brings life back to your body faster. I have been vegan for just over 13 years and never encountered any struggles with being an endurance athlete on a vegan diet. Was it difficult to be a vegan during your stay in India? How did you manage? Being a vegan in India was not an issue at all. No matter what area I was in there were always plenty of delicious, fulfilling, protein-packed options. It did help to have wonderful hosts and teammates to help guide me during my stay, but even if I was traveling alone I could have easily managed in finding vegan fare. How do you see the rest of 2019 panning out? Any specific races that you are focusing on? Racing Vagamon Ultrail has sparked my excitement for 2019! I will spend the spring focusing on training for my next big race – Comrades. I will also do some bike racing in the spring to maintain a healthy mix. After Comrades my focus will shift on retuning to UTMB to race OCC. There will be plenty of other races throughout the year which are still in the works. And I plan to wrap up my year with more cyclocross racing again!